Kaskau (North Tripura)/Agartala, Jun 5 : Mizoram Bru (Reang Tribes) refugees in Tripura are reluctant, none of them turning up for identification till the third day on Thursday at Kaskau relief camp in North Tripura district, officials said. Mizoram-Tripura-Bangladesh border Mamit district Deputy Commissioner representative Victorladam Puiya who had gone for the identification at the Kaskau camp said, "Three identification teams from Mamit and one from Kolashib has come and started identification from yesterday but there is no turn out. We have been waiting from 10 AM today but till now no one has come. We will extend our wait till 4 PM today and tomorrow also we will be continuing this identification process, lest some of them turn up." "Actually the camp leaders said that they are supporting everything and have conducted public meetings and encouraged everyone to come here. There is no major opposition but they also can't say why they (inmates) did not turn up. It's a bit confusing. We have informed everybody but not a single person has turned up, we don't know the exact reason," he added. 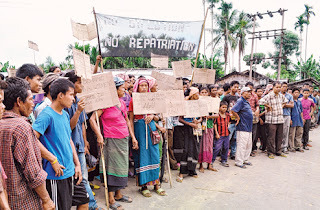 As per earlier tripartite talks between Mizoram Government, Mizoram Bru Displaced People's Forum (MBDPF) and Tripura Government, identification of bonafide residents of Mizoram for repatriation started at the Kaskau camp from July 2 June 2 but not a single family turned up. The Mizoram Government made arrangements for resumption of repatriation of Brus from the six relief camps in Tripura and proposed to repatriate more than 3,500 families. The preparations came after the Supreme Court instructed both the Centre and the Mizoram government to repatriate all the Brus within six months. "We did not go because what is the use in returning as we will not be secure and have land to cultivate there. After two years when the package will be over who will look after us," said an inmate Parvati Reang. Meantime, MBDPF general secretary Bruno Mesa speaking to ANI at Agartala said: "In this regard, MBDPF have been cooperating with both the government of Mizoram and Tripura and also trying to convince our people to return. To live in relief camp is very unwanted but our people have not turned out in this identification process because after viewing the road-map prepared by the Mizoram government, they found that there is no development and this road-map is very uncertain for their future survivor. The spots selected for rehabilitation is not satisfactory for the (Bru) people as it is mainly in Mizo dominated areas. Moreover, the demands which MBDPF had submitted are also not considered and there is no point agreed by Mizoram Government to be materialized. May be this is the reason why our people have not turned in the identification process." The MBDPF demanded for allotment of sufficient land to each repatriated Bru family so that they can cultivate after constructing house in Mizoram. They also demanded for reservation for the Bru people in Mizoram under the primitive tribal category. The MBDPF leader said that the Mizoram Government needs to change their mindset in rehabilitating the Bru people in their territory so that the roadmap is acceptable to the Bru people who may feel secure after returning to their home state after 18 years. Beside this they have also demanded enhancement of the repatriation package from the earlier demand of Rs 80,000 per family. Around 35,000 Bru displaced people of Mizoram for the last 18 years have been living in seven camps in Kanchanpur of North Tripura after an ethnic violence flared up with the majority Mizos. The Mizoram government had objection on the total number of Brus which according to them is much less. For the identification of the Brus, the process was supposed to start from Kaskau camp followed by repatriation from June 8.